Born in Chippewa in 1924, Edna Coombes was a Niagara native all of her life. She met her husband William Coombes at Bentley’s Bat Factory in Niagara Falls where they made tennis rackets. William, Bill as he was called, was engaged when they met but she won him over with her charms and they married in 1945. Edna was the mother of four children, two boys and then two girls. She was a stay at home Mom and she actively participated in her children’s lives including being a member at the Home and School meetings. She would knit sweaters, scarves, mittens and sew clothing, creating for all of her children. She continued this tradition, knitting for her 6 granddaughters and 1 grandson. childcare was needed even travelling by bus to get there to help out. Her family expanded to include 4 great grandchildren whom she cherished. She never failed to express love to her family. Hugs and kisses were always necessary and every phone call ended with love you. When asked how she was doing she often replied fine now that I see you. A social butterfly, she started a women’s group entitled the Cameo Club and they met monthly at various homes to play bingo, chat and drink tea. Each member had to wear a cameo pin to the meeting and if you forgot you had to pay a fine. The group grew to over 20 members at its highest. She lost the love of her life when she was 58 after 35 years of marriage. She never did remarry but definitely continued to participate in life. 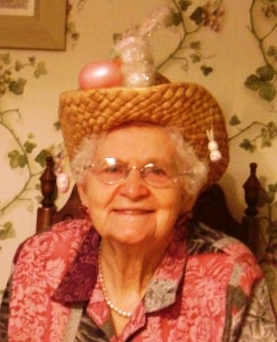 Edna was very active in her community and became a member of the Coronation Seniors Center when she was only 55. As a member she was involved in various groups and was a part of their band playing spoons, blowing in tea pots, singing and travelling to Seniors Homes and Nursing Residences to entertain. She was the president at the Coronation Centre for a period of time and helped with fundraising, craft making and luncheons. Along with her good friend Vera, they were known to dress up for various skits as they entertained others. She received a volunteer of the year award from the mayor of Niagara Falls at Canada Day celebrations for all the work she had done. Another one of her many talents was her ability to know and remember everyone’s birthday. Nieces, nephews, cousins, in-laws and friends of friends and she had to send cards to all of them. She made sure that she was present at all celebrations and ensured that her family celebrated all occasions and birthdays, even if they didn’t want to, for her, you could not say no. On a few occasions she got into the wrong car because it was the same colour as the one she was supposed to get into. She never did drive as her sons said if she did they would have to take their cars off the road. She was a huge Blue Jays fan and could be heard yelling at the television whenever they played and she would call her brother, Ken, a Boston fan, and hang up whenever they had a homerun. On December 19th, 2013 she passed away at home surrounded by family at the age of 89. Her family now has a huge hole in it that can never be filled. They are so thankful to have had such an amazing mother, grandmother and great-grandmother. As her great-grandson Tallyn put it, “There is a reason why we called her great!” I am so grateful that I got to call her Mom.